Tips for Making your Korean Apartment feel like Home! My apartment has been one of the best aspects of teaching abroad. Decorating and maintaining a comfortable space for relaxation and entertaining can enhance your experience in Korea by turning your boring apartment into a place for dinner parties, beer pong, movie or game night. If you're like me, the appearance, ambiance, and functionality of your home is important to you; however, when you're living in another country, it's easy to find yourself at a loss when it comes to buying the basics like bedding, decorations, pillows, furniture, and kitchen items. Luckily, this post is completely dedicated to tips and tricks for making ANY Korean apartment absolutely FABULOUS! Tip #1: Do Not Buy Furniture: Many Korean apartments come with some of the basics: A bed, night stand, or dresser-drawers. However, some people may want a table, desk, chairs, book shelves, or a standing mirror. Luckily, the majority of these items are often handed down from teacher to teacher. When you arrive at your school, ask your fellow teachers if there's anything from their apartment that you can talk off their hands. Furthermore, several of the items in my apartment (including my snazzy, full-wall, bookshelf) were literally found by "dumpster diving." Most Koreans leave old furniture outside to be hauled away by the city. It may sound tacky to some, but during my time in Korea I acquired a table, chairs, and book shelf simply by recycling other Koreans' unwanted furniture that had been left by the side of the road. As they say, one man's trash is another woman's treasure. Trick: Korea has dozens of stores that sell painting supplies. If you find a table or bookcase that is unsightly, buy some paint at your local store and dress it up a bit. My bed. All bedding was either provided by ChungDahm or former teachers. Tip # 2: Happy, Happy, Happy Emart-uh: E-Mart is essentially the bigger, better version of Walmart for Korea and you can find one in virtually every city. Here you can pick-up basic necessities like bedding, dishes, and food to stock your kitchen, or luxuries such as candles, art work for your walls, or decorative floor mats. Emart can be pricey at times, but looking for items on sale is always advised. Trick: If you find that Emart is too rich for your blood, visit Daiso. The Dollar General of Korea, Daiso provides kitchen supplies, house plants, knick-knacks, candles, and (most importantly) shot and wine glasses for entertaining. Tip # 3: Less Is More: Keep in mind that some you may only be staying in Korea for a year or two. Not to mention, between teaching and traveling, you may not spend much time in your apartment. Try to minimize the amount of money you spend and the junk that you accumulate by keeping it simple. Tricks: (1) Purchase decorative floor mats to add color to an open space. (2) Buy candles to add light to any room and a cozy, lived-in feeling. (3) Instead of springing for art work or posters, create your own paintings and pass them on to other teachers when you leave. (4) In place of a sofa or couch, buy decorative pillows and a floor mat to provide comfortable seating. 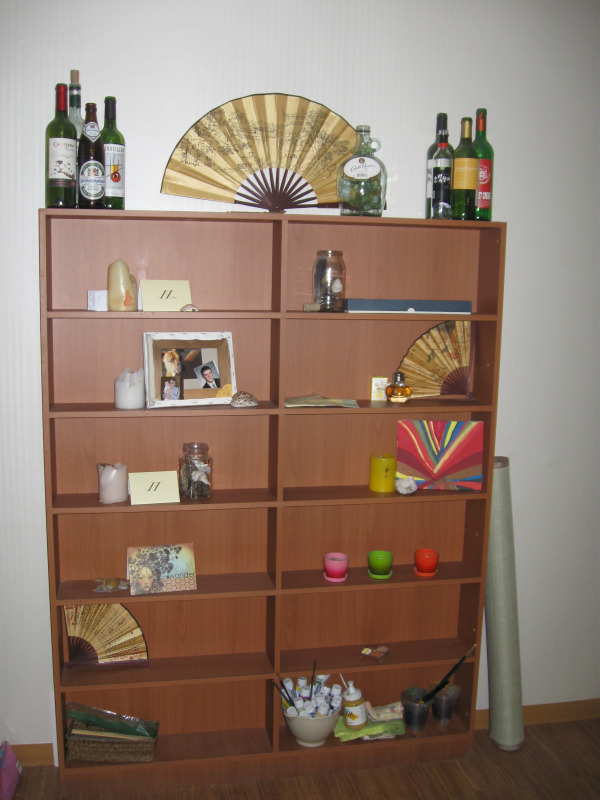 A bookshelf that I picked up on the street after it was discarded by a DVD shop. Tip # 4: Share, Share, Share: Many teachers in Korea share items such as books, DVDs, ovens, rice makers, and blenders. The logic is that these items can be expensive and are often difficult to ship or carry home. As such, ask the teachers at your school if they would like to purchase a communal oven for baking (most apartments in Korea do not have ovens), a rice maker for dinner parties, or books and DVDs to pass around for entertainment. This will not only save you money, but it will also help you to connect with your fellow teachers and build relationships based on similar interests. Trick: When you have finished your time in Korea or move to another Korean city, ask new teachers (who may not have certain necessities and luxuries) if they would like to take books, DVDs, and appliances off your hands at a reduced price. In this way, you can help out a newbie and make some of your money back. Living in another country, though exciting, can leave you feeling homesick at times. So follow the above tips and tricks to help you turn your Korean apartment into a home where you can be creative, relax, and, of course, entertain. After receiving her degree in Secondary English Education from Indiana University, Hope Gately wanted to experience Korea's famous educational system, which is currently ranked #2 worldwide. She began teaching at the Pohang-Namgu branch of ChungDahm Learning in Korea last year, after being recruited by Aclipse. Since Hope is an avid hiker, foodie, and fashion enthusiast, she loves living in Korea and enjoys the mountains, cuisine, and "Kill-Heels." Questions about teaching in Korea? Follow Hope on Twitter at www.twitter.com/AclipseHope and email her at Aclipsehope@gmail.com! 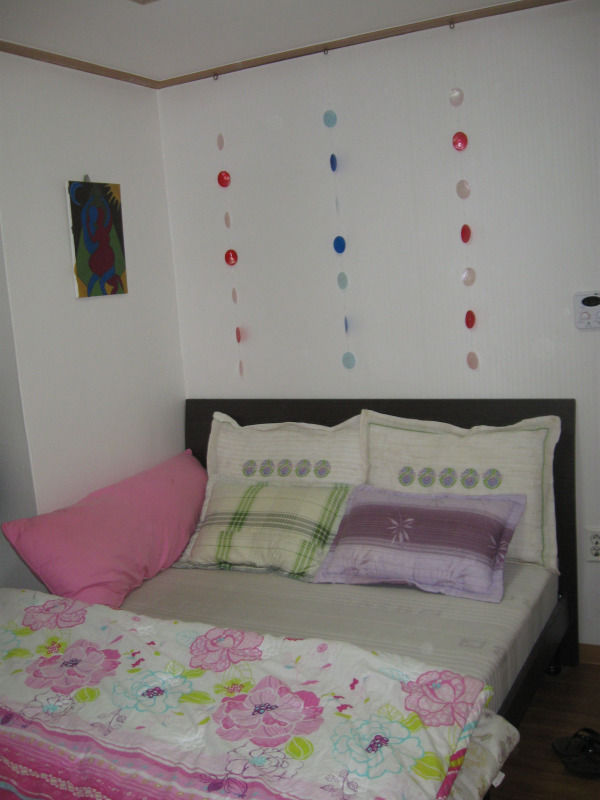 Follow Aclipse on Twitter, where we'll be posting more pics of Hope's awesome Korean digs.